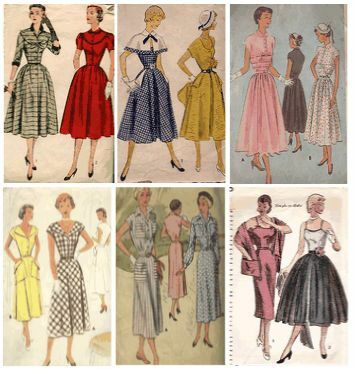 When speaking about fashion, If I could have been born in a different era, I would have chosen the 1950’s. I absolutely love the styles that were “in” at that time period. It seems though, that it was all relatively the same, with only the patterns changing. But that’s okay because I love these dresses!!! Here are some of my favourite that I found when doing a search. On most of the dresses during this era the top part was fitted to appear of a small waist and the bottom skirt was beautifully flared! Certain variations of this style were absolutely elegant. 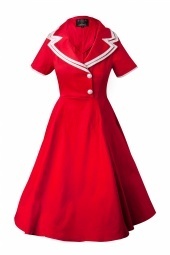 There are still dresses similar to these available in certain stores, but not as flared. Love this style. 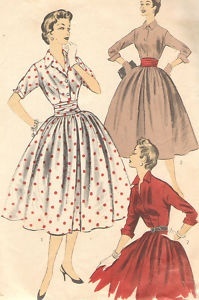 And what I especially love about vintage fashion is of course, for the most part it was modest and very feminine. Beautiful Colour and Pleats, Love the Gloves too! Love this Colour & Collar! Gotta love 'em Polka Dots! Hope you enjoyed this post. If you could choose your favourite fashion era, what would it be? I would have to agree, same one :)! !